Italian cycling star Marco Pantani has been found dead in a hotel in Rimini. The 34-year-old climbing specialist, nicknamed "The Pirate", won the 1998 Tour de France and Giro d'Italia. But his career was blighted by doping allegations after he was thrown out of the 1999 Giro d'Italia for failing a blood test. "I'm devastated, it's a tragedy of enormous proportions for the entire cycling world," said fellow cyclist Mario Cipollini. 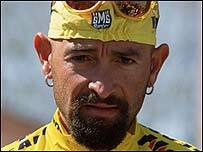 Pantani's body was found by a member of the hotel staff on Saturday evening. Investigators ordered an autopsy on Monday to determine the cause of death but violence was immediately ruled out. Magistrate Paolo Gengarelli said there were no illegal drugs in the room but 10 packages of prescription sedatives were found at the scene, some empty and some started. The coach of the Italian national cycling team Franco Ballerini said: "It's something that is so huge, it doesn't seem true." Pantani, who spent the last few years fighting for his reputation, last raced in the 2003 Giro, finishing 14th. But soon after he entered a health clinic specialising in the treatment of depression and drug addiction. Pantani was the first Italian to win the Tour de France, cycling's premier race, since Felice Gimondi in 1965. Gimondi, who coached Pantani for two years, told Italian newspaper Gazzetta dello Sport: "I am shocked and traumatised. "Marco has paid a very dear price for everything. For years he was in the eye of the cycling storm after being world number one. "He then withdrew into himself. He was alone." Gengarelli said that Pantani, who had been treated at a clinic recently for depression, had written "some thoughts" on hotel stationery but it was not a farewell note. Spain's five-time Tour winner, Miguel Indurain, called Pantani a "tragic genius". Pantani was the last man to win the Tour before American Lance Armstrong embarked on a record-equalling five straight victories. But his career went into free-fall when he was ejected from the 1999 Giro while in the lead after failing a test for haematocrit - an indicator, though not proof, of the use of performance-enhancing drugs. Scandal followed Pantani, and during the 2001 Giro a syringe containing traces of insulin was found in his hotel room in a police raid. Pantani insisted the syringe had been planted and that he did not stay in the room on the night in question. A court dismissed his claim for lack of proof, and he was suspended for six months but he was acquitted of sporting fraud in October last year. Pantani's team Mercatone Uno were not invited to take part in the centenary Tour de France last year. Pantani, who was also third in the Tour in 1994 and 1997, began his career with the Carrera team.